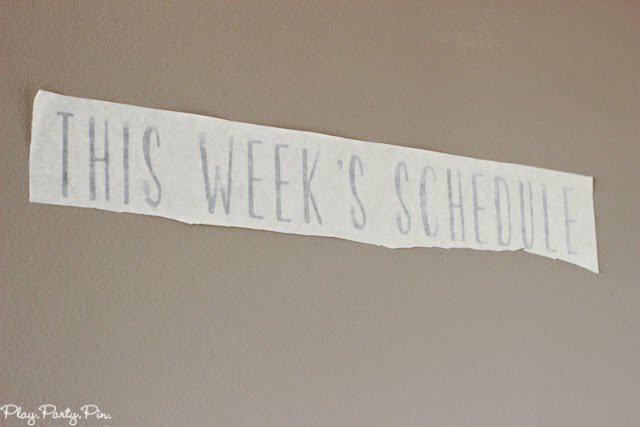 Last week I showed you all the creative side of my craft room and today, I’m sharing the “office” side where all of the business and planning stuff gets done. I tried to keep it colorful and fun to help keep me inspired while doing all of the not so fun stuff. Immediately to the left of my super organized closet is my working corner. Basically, a desk area where I can organize my thoughts, schedule out my week, and do any other busy works that needs to get done. In order to add some color to the space, I picked up four matching square bulletin boards at Target. I covered two of them with fabric to match the hot green and hot pink in the room, and I kind of love them. 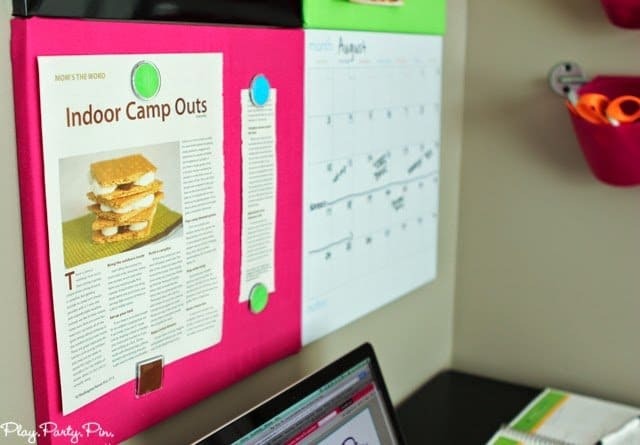 The four boards serve different purposes – black dry erase board, green cork board for inspiration photos, pink magnet board to put up my own accomplishments (like my indoor campouts article) for when I get discouraged, and finally, a white monthly calendar. 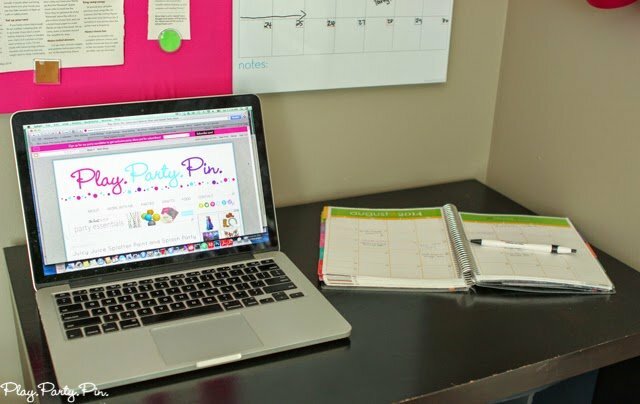 On my desk you’ll typically find my laptop, Erin Condren planner (that I LOVE), and my sketch book. Those are the three things I use most often, and I love having enough space to work with all three together at one time. 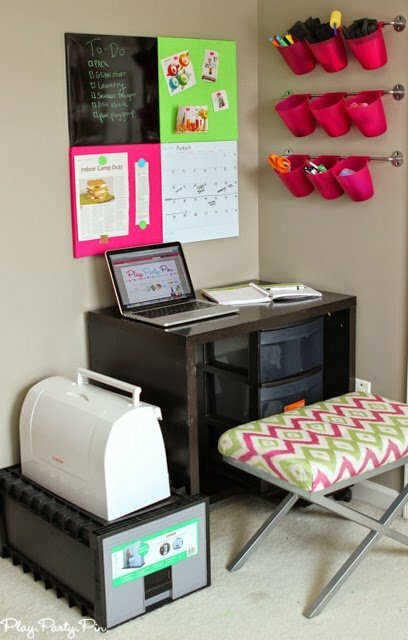 Up on the wall to the right of the desk are a bunch of hot pink storage containers that I bought at IKEA. They are absolutely perfect for storing things that I need to work like pens, highlighters, etc. Since I also use this as my sewing desk when I actually sew, I also have my needles, measuring tape, sewing scissors, etc. in the cups. My favorite thing about the cups is that they come off and on really easy so I can move them around and re-organize them however I want throughout the day. On the ground next to the desk is my sewing machine and fabric storage. I don’t sew as often as I’d like so the sewing machine is packed away most of the time. 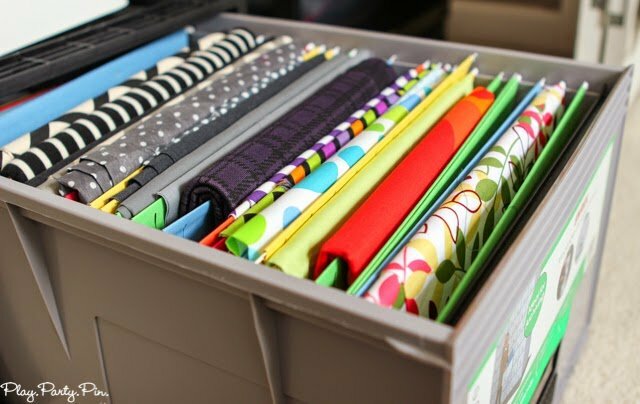 I also have a bunch of fabric underneath my bed in rolling storage containers, but the fabric I use the most often is neatly tucked into an old filing drawer. 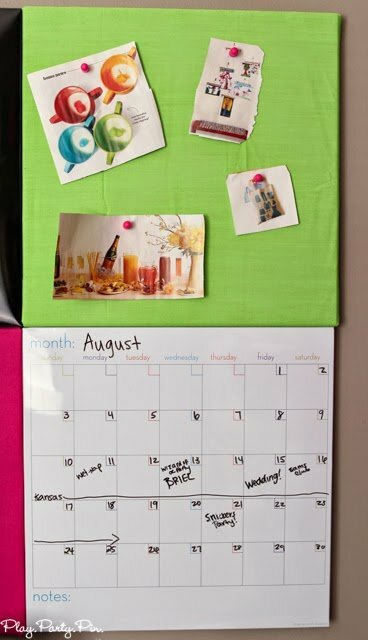 Last but not least is my favorite part of this side of the room, my awesome wall sized chalkboard calendar from Wallternatives. 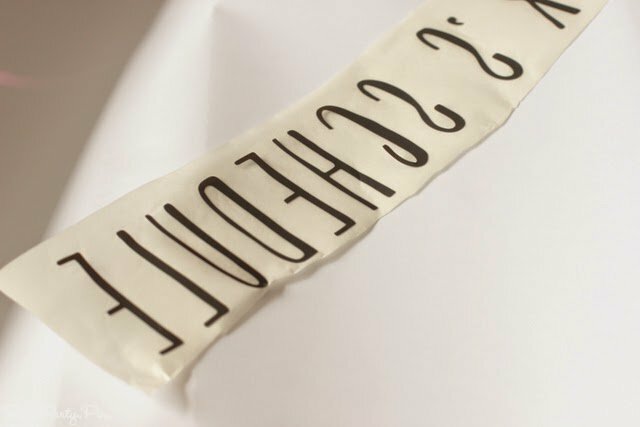 They have an incredible selection of wall decals that are perfect for dorms, offices, and small spaces. 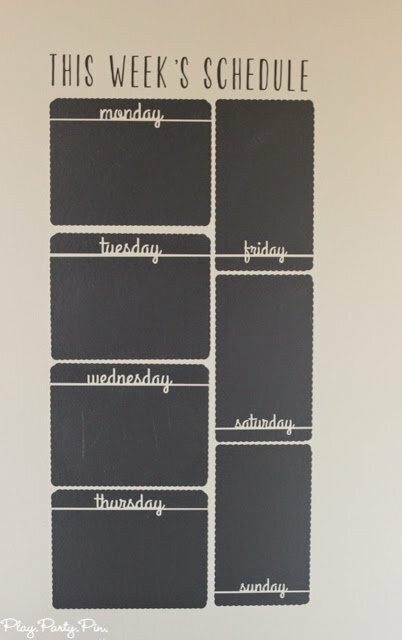 I knew when I saw the Vertical Week Schedule Chalkboard Vinyl Wall Decal that it would be the perfect addition to my room, and I even had an open wall that I could dedicate just to the schedule. I pretty much love it, which is good because it’s the first thing you see when you walk into the room. 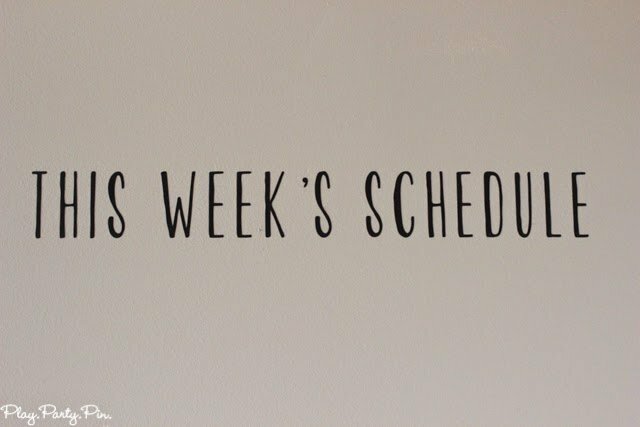 I love being able to have such a large visual of what my schedule is for the week. 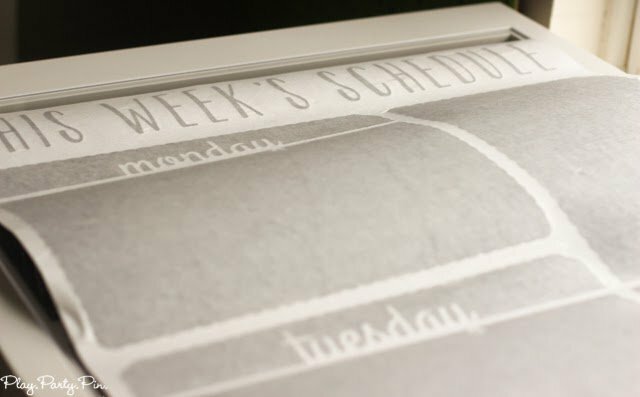 Now that we’re back from vacation, things are getting busy again, and it’s way too easy to forget a deadline or a dr. appointment. No more forgetting with it all written on the wall! And it was so easy to put up. All I did was remove the paper from the decal Wallternatives sent me, stuck it on the wall, rubbed it on with the handy tool that came with the decal, and pulled the paper off. And voila, I now have an awesome chalkboard wall calendar! 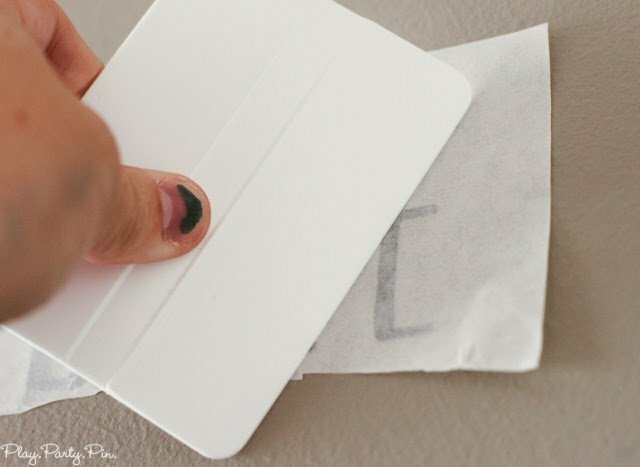 The Wallternatives™ ChalkTalk™ Chalkboard Art is perfect because it has a slight texture making it perfect to write on with chalk, and they wipe clean easily with a damp towel. Perfect for my ever changing schedule! 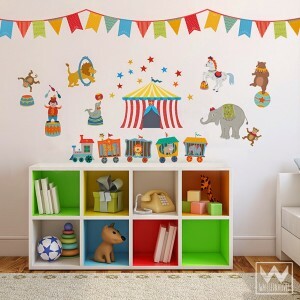 Wallternatives wall decals are perfect because they are easy to remove, so if we want to sell our house in a couple of years and transform my craft room back into a guest room, I can easily take down the calendar. 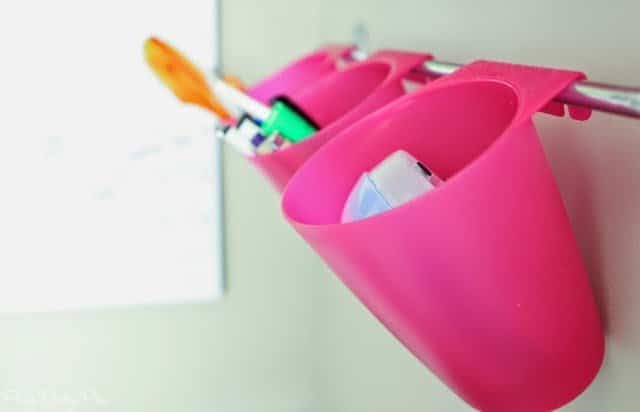 They’re seriously the perfect way to spruce up any room or space without having to commit long-term because they’re so easy to change out if you get tired of the design. Go check out their website to see all of the fun designs available but be warned, you may get addicted and want to buy everything. 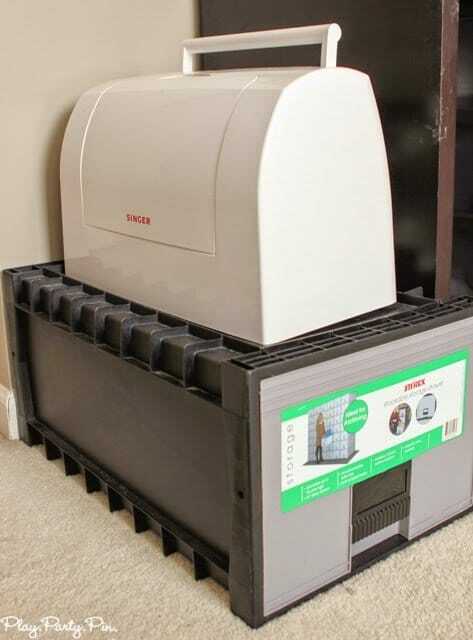 I’ve already got these items on my wish list for future projects. 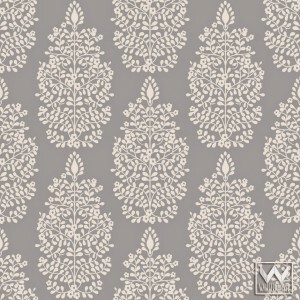 You can learn more about all of the awesome Wallternatives products by checking out their FAQs page. Already know you want to try out Wallternatives? Choose a color with their color chart or be inspired by all of these great design ideas. And there you go, my craft room in all its glory. Maybe one of these days I’ll show you the guest bedroom portion of the craft room, but that would mean I have to clean off the bed. 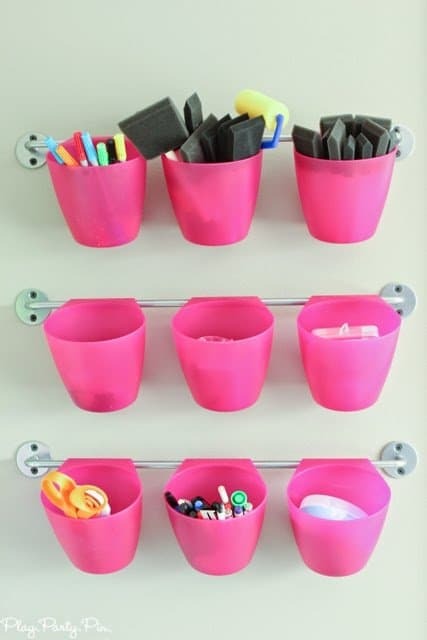 How do you keep your office area and life organized? I love it! Like I said last week, I still don’t have my own craft/office space, but yours is so inspiring! 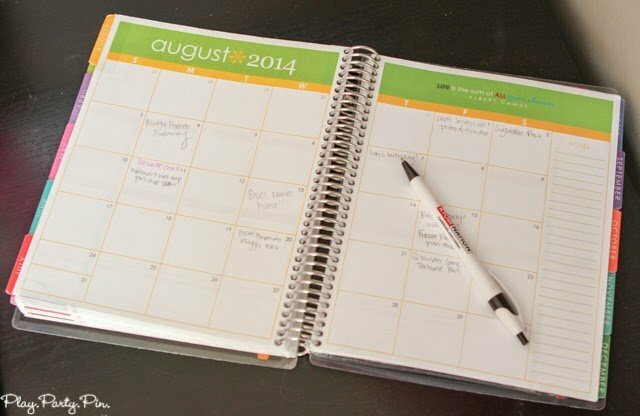 I just use my handy binder to stay organized right now, and it always helps to have specific places to put things!